Parklands has one of the highest number of children eligible for Pupil Premium money in Leeds at 72%. In 2017/18 Parklands Primary School will receive £275,240 in Pupil Premium. 36% of children are eligible for Free School Meals (FSM), compared to 17% for Leeds primary Schools and 14% for state-funded primary schools nationally. 61% attract pupil premium funding, compared to 28% in Leeds and 23% nationally. 27% of children are from Black and Minority Ethnic (BME) backgrounds, compared to 35% for Leeds primary schools and 33% for state-funded primary schools nationally. 12% of children have English as an additional language (EAL), compared to 22% for Leeds primary schools and 21% for state-funded primary schools nationally. 28% of children have special educational needs (SEN), compared to 15% for Leeds primary schools and 13.5% for state-funded primary schools nationally in 2017. 81% of children who attend the school live in an area classed as being amongst the 10% most deprived in England. Moreover, 70% of children live in an area classed as being amongst the 3% most deprived. Low aspirations of the parents. Data Source: Perspective Lite July 2018. Data Source: Perspective Lite July 2018. NB National figures for Disadvantaged children are based on imcomplete figures (approx 78% of national cohort) and should be treated with caution. Only 8 of the 46 children in the year group were not included in the Disadvantaged group. Interestingly, the attainment of these ‘Other’ children was much lower than average, with only half of them achieving the expected standard in Reading, GPS, and Writing. 3 of these 8 children have arrived from overseas during KS2. The attainment of Disadvantaged children (who make up 82% of the year group) is much higher than that of Disadvantaged children in Leeds overall and in England, and their combined RWM measure is higher than that of ‘Other’ (non-Disadvantaged) children nationally as well. Data Source: Perspective Lite July 2018. NB National figures for Disadvantaged children are based on incomplete figures (approx 79% of national cohort) and should be treated with caution. The Disadvantaged group has a GLD figure which is almost exactly the same as that of the non-Disadvantaged group. Across Leeds and nationally, there is a gap of about 20%pts between the GLD rate of the Disadvantaged and non-Disadvantaged groups. The overall GLD figure for the school (65%) is better than achieved by most other schools with similarly high proportions of FSM-eligible children. Data Source: Perspective Lite July 2018. NB National figures for Disadvantaged children are based on imcomplete figures (approx 73% of national cohort) and should be treated with caution. Almost two thirds of the year group are included in the Disadvantaged group. In each subject, just over half of them achieved the expected standard, but only 41% achieved the expected standard in all three subjects, compared to 65% of the ‘non-Disadvantaged’ children. The attainment of the Disadvantaged children is very similar to that of the equivalent group in Leeds as a whole, but lower than that of the National Disadvantaged group. Parklands has officially the highest number of children eligible for Pupil Premium money in Leeds at 72%. In 2016/17 Parklands Primary School will receive £260040 in Pupil Premium. 46% of children are eligible for Free School Meals (FSM), compared to 17% for Leeds primary Schools and 15% for state-funded primary schools nationally. 72% attract Pupil Premium funding; the joint highest of any primary school in Leeds. 25% of children from Black and Minority Ethnic (BME) backgrounds, compared to 33% for Leeds primary Schools and 31% for state-funded primary schools nationally. 11% of children have English as an additional language (EAL), compared to 20% for Leeds primary Schools and 20% for state-funded primary schools nationally. 32% of children have special educational needs (SEN), compared to 14% for Leeds primary Schools and 13% for state-funded primary schools nationally. An additional teacher in; in KS1 (Y2) and four in Key Stage 2 to reduce class sizes and accelerate learning. Additional teaching to ensure learning during PPA time is maximised in Key Stage 2 and Year 2 providing specialist Grammar teaching. Additional Speech and Language provision including Teaching Assistant support. Support for Breakfast Club to ensure a good start to the day and fresh fruit and milk for the whole school. Subsidising enhancement activities such as residentials and educational visits. *88% of the year group are eligible for Pupil Premium (PP) funding, either due to historical FSM eligibility or Looked After status – and therefore identified as ‘Disadvantaged’. * That their performance is consistently in line with that of ‘Other’ children nationally. * 12 children (36% of the cohort) were identified as eligible for Free School Meals. * 7 (58%) achieved GLD; this proportion is higher than the 46% achieved by FSM children across Leeds and the 51% achieved by FSM children nationally in 2015. * It should also be noted that the proportion of non-FSM children who achieved GLD in this cohort (62%) was lower than achieved by ‘similar’ children in Leeds (66%) and nationally in 2015 (69%). Consequently, the in-school gap between FSM and non-FSM is much smaller than average, at just under 4%pts; compared to a Leeds gap of 20%pts and a national gap in 2015 of 18%pts. *An additional 4 children were identified as eligible for pupil premium (PP) funding, meaning there was a total of 16 children in this group. 10 (62.5%) achieved GLD; this is higher than the GLD figure for ‘Other’ children in the year group (59%) and much higher than for PP children in Leeds (46%). National figures for PP children are not currently available. * These children are identified as ‘Disadvantaged’, either due to historical FSM eligibility or Looked After status. * The results for this group see large in-school gaps (ranging from 23%pts to 35%pts) between Disadvantaged and ‘Other’ children. * There are also large gaps between the school’s Disadvantaged children and Disadvantaged children nationally (ranging from 27%pts to 34%pts). * 2016 / 17 has seen a 3rd class formed in Y2 to create small class sizes. In Y3 to narrow the gap a 3rd teacher is employed (0.4). * In a school where PP is so high (Y6 30 children Pupil Premium, 3 non PP), it is difficult to exclude the few. Therefore ALL the children benefit from small class sizes, Speech Therapy and interventions. Parklands has officially the highest number of Pupil Premium money in Leeds at 81.1%. In 2015 / 16 Parklands Primary School received £325 380 in Pupil Premium. An additional teacher in Foundation Stage; in KS1 and three in Key Stage 2 to reduce class sizes and accelerate learning. A Behaviour Support Worker and an additional Learning Mentor to meet the needs of the vulnerable children. How did these actions impact on raising attainment? % of the disadvantaged children 75% attained Level 4 in Reading, Writing and mathematics. This is 5% higher than the 70% National Figure and higher than the 67% of other Parklands figures. 78% @ L4 this is 5% behind the 83% Nat figure but 11% higher than Parklands other. 81% @ L4 this is 2% higher than the 79% Nat figure and 14% higher than Parklands other. 72% @ L4 this is 1% higher than the 71% Nat figure and 14% higher than Parklands other. 75% @ L4 this is 5% behind the 80% Nat figure but 8% higher than Parklands other. Expected Progress in Key Stage 2. The proportion of disadvantaged children making expected progress in reading has risen from 82% in 2014 to 89% in 2015 and is just below the national figure for ‘Other’ children of 92%. The proportion of disadvantaged children making better than expected progress in reading has risen from 25% in 2014 to 34% in 2015 and is above the national figure for ‘Other’ children of 33%. The proportion of disadvantaged children making expected progress in writing has risen from 89% in 2014 to 91% in 2015 but is below the national figure for ‘Other’ children of 95%. The proportion of disadvantaged children making better than expected progress in writing has risen from 32% in 2014 to 46% in 2015 and is well above the national figure for ‘Other’ children of 37%. The proportion of disadvantaged children making expected progress in maths has risen from 71% in 2014 to 86% in 2015 but is below the national figure for ‘Other’ children of 91%. The proportion of disadvantaged children making better than expected progress in maths has risen from 21% in 2014 to 29% in 2015 but is below the national figure of 37%. 54% @ L2b this is 17% behind 72% Nat figure and 5% lower than Parklands other. At KS1, attainment is low for both disadvantaged and non-disadvantaged children and the gaps to ‘other’ children nationally are consistently large. The proportions of disadvantaged children making expected and better than expected progress at KS2 are generally in line with and sometimes above those of ‘Other’ children nationally. The KS2 VA scores of disadvantaged children are broadly in line with national in reading and writing and above average in Writing. The in-school attainment gaps between disadvantaged and ‘other’ children are much smaller than the gap to national ‘other’ children. The APS gap between the school’s disadvantaged and national ‘other’ children is around 3pts overall. The attainment gap at L4+ is relatively small, but is much larger at L5+. 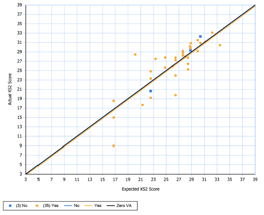 The VA scatter plot shows that the vast majority of disadvantaged children made progress that was broadly in line with expectation, with only 2 children making progress that was 2 points or more below expectation. This money has been invested in reducing class sizes in KS2 – creating 2 new positions. 2 additional teachers were employed in KS2 to deliver intervention strategies for PP pupils. A class based teacher was moved to deliver interventions in Y3 and Y4. The DHT was made available to raise performance of Year 2 children for 3 afternoons per week. Breakfast club will continue to be heavily subsidised by PP money to ensure the children are in school and safe to learn. School residentials and enrichment activities such as links with Northern Ballet will be subsidised significantly from PP money. The school is accountable for the distribution of the Pupil Premium funding and is committed to ensuring that it is used to positively impact on the outcomes of children’s learning. In addition the substantial investments in staffing and training will see scores in Key Stage 2 rise dramatically in line with KS1 when comparing to National Data.